Keep an eye on your cats in vintage style with the Casio Pi - a 1990s pocket TV that displays video streams using a built in Raspberry Pi. In this tutorial I'll show you how to convert an obsolete portable LCD TV into a low-cost and retro-cool display for a Raspberry Pi project. I'll take you through all the stages of making a handy CCTV monitor with a 1997 Casio EV-510 and a Raspberry Pi Zero W, but we'll also look at the many other possibilities! 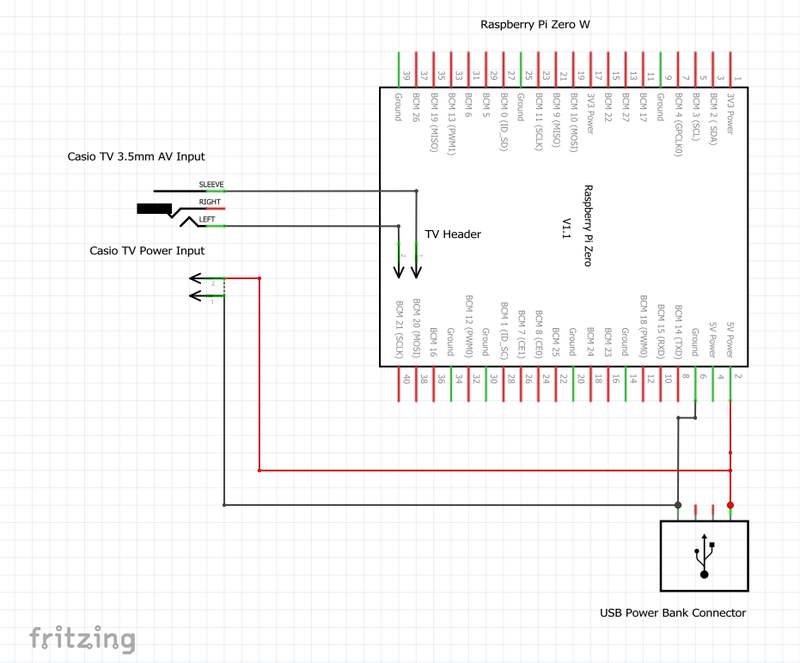 The original TV circuit is untouched and the Pi is fixed neatly under the battery cover, playing a video stream from the local network and all powered from a USB power bank. I love these pocket LCD TVs, especially as they're so cheap to pick up second hand, I remember paying £2 for this one. Since the analogue TV channels were switched off they're pretty much useless - unless you have one like this that has the all-important 3.5mm Audio/Video input, in which case you can easily give it a new lease of life with a Raspberry Pi. It's a pretty straightforward build - you can see the project in action and follow the whole end-to-end process on the YouTube video at https://youtu.be/SLkvcTYdm-A, there are also links in each Instructable step to the relevant parts of the video. Before doing any dismantling I wanted to test the setup to make sure this old TV would work with the Pi. I set a video stream running on the Pi Zero using omxplayer(more on coding this later) then experimented with different cable combinations to connect the jumpers of the analogue video output of the Pi to the 3.5mm Audio/Video input of the TV. This took some trial and error to get a clear picture (if you have a very bad picture it's likely the wiring of the cable!) but I ended up with a clear view from the local IP camera. I also tested powering both the Pi and the TV simultaneously from the same USB source and thankfully this worked - I planned to use a USB power bank so needed to use a single power cable for both. Having convinced myself that it would work I moved on to more fiddly matters - dismantling the TV. I had two main objectives for the dismantling - to get the TV circuit out of the case without destroying it and to double-check that the Pi would actually fit in there. The dismantling went well at first, just four small screws held the two halves of the TV together and they came apart quite easily. Unfortunately all of the TV's circuitry was fixed to the front side, ruining my hopes of easily turning the battery compartment into a cosy Pi-den. Finally the circuits are clear of the case. It turned out that all of the circuit components had to be removed from the case, really tense work as one false snip would bring an end to the project. The LCD panel was attached to the circuit with a small ribbon cable, which I was very nervous of removing, but once that was out of the way I was able to separate the circuit boards a bit and gain access to the final screws holding in the LCD panel. Next I fired up the rotary tool and started chopping away the battery holders, leaving what I hoped would be plenty of space for the Pi. Checking it afterwards however it was obvious that the Pi Zero I'd been using for testing was never going to fit. It had a standard 40-pin header soldered on, but in addition to that also had a Button Shim, which was bulking it up far too much. I decided to start over with a fresh Pi Zero, leaving the header off - but even then it was still too wide, so I had to do some more detailed chopping around the case as well as remove part of the Pi's camera connector. It was a perfect fit finally, but with not even a millimetre to spare. I needed to save as much space as possible to stand a chance of the Pi still fitting once all the original electronics had been reassembled, so decided to power it via the GPIO instead of with a Micro USB cable. I read up on the risks of doing this beforehand, and was happy to continue. Instead of fitting a 40-pin header I just soldered a red wire to 5v (pin 2) and a black wire to GND (pin 6) as the rest of the GPIO pins wouldn't be needed for this simple build. Next I snipped a four-connector piece off the end of a right angle 40 pin header for the TV connection and soldered it to the board. Only two of the connectors were needed, but having the four together gave it a bit more stability. The beauty of using the right angle header piece is that the connecting TV cable stays nice and flat along the top of the Pi rather than sticking up. Lastly I joined a couple of female jumper cable ends to a stripped-down 3.5mm audio cable to make the connector between the Pi and the TV. The internal wiring of these cables can vary so you may need a bit of trial and error if you're doing the same. The soldering wasn't too taxing, just six joints (though I did mess one up and had to re-do it) so I moved on to setting up the Pi software. Enabling SSH - As this Pi would be running headless I enabled SSH so I'd be able to log into it remotely, for example to change the URL of the video stream. This setting can be changed in Preferences > Raspberry Pi Configuration > Interfaces. To my amazement a live view from the camera popped up on the screen straightaway! The camera I'm using is another Pi Zero, powered by a LiPo battery and running MotionEye OS, which I'd already set to a 4:3 resolution so that the stream would be the right shape for the TV. The --live part of the command helps it play without buffering, and it works really well. After a reboot the stream loaded instantly once the Pi desktop had loaded - coding done! Before starting the assembly I tested the newly-programmed Pi to make sure everything was working as intended, then began by soldering the power inputs of the Pi and the TV to a USB cable. Next I carefully bent back these wires so that the Pi was sitting in roughly the right place on the circuit board. I was able to fairly easily reverse the dismantling process, nervously fitting the fiddly screws, and just before putting the case halves back together I hot-glued the Pi to the case. I normally like to use bolts or screws for this but there just wasn't the space this time! It took some gentle squeezing and persuading but eventually the case closed with a click and I was able to secure it with the final four screws. One final test and I was so relieved to see the Pi logo and boot sequence! With everything working I secured the USB cable to the back of the TV with cable tie holders, and hot-glued a handy USB power back to the back of the case, in place of the kick-stand. This was a fun little build, it didn't take a long time and the coding wasn't too complicated but I'm very pleased with the result. It's a really practical piece now, and I love that I didn't have to change the external appearance too much. You could easily achieve the same thing using a new LCD display from one of the Pi accessory shops, but for me the challenge was making use of a TV that had cost me £2, bringing an obsolete piece of old tech back to life. Which one of you is next? I have several more of these TVs and I'm now thinking what else could be built! Zowie a locally stored cartoon on a loop! - Now that the Raspberry Pi TV HAThas been released you could even stream a live digital TV signal from another Pi on the network to this little Casio - bringing it full circle and keeping faithful to its original function.My TV HAT arrived a few days ago so this may well be the first thing I try. Subscribe to Old Tech. New Spec. on YouTubefor more project videos! I love the design and ambition of vintage technology, and the usability and potential of new - my passion is bringing the two together.